President Trump has been hammered for the government’s response to Hurricane Maria and the devastation it wrought in Puerto Rico, the U.S. Virgin Islands and elsewhere. And new polling shows the American public mostly agreeing with those critiques. Unlike their reaction to Trump’s response over Hurricanes Harvey and Irma, Americans are more likely to disapprove than approve of the job Trump is doing when it comes to Maria and its aftermath. The latest Associated Press/NORC poll found that just 32 percent of Americans approved of Trump’s handling of disaster relief for victims of recent hurricanes “in U.S. territories, including Puerto Rico and the U.S. Virgin Islands,” while 49 percent disapproved. In the same survey, 48 percent approved of his handling of disaster relief in Florida and Texas; just 27 percent disapproved. Trump’s ratings on Maria seem to be sliding as more Americans form an opinion on the subject. Last week, a YouGov survey found that 45 percent of Americans approved of the job Trump was doing after Maria, while 31 percent disapproved. This week, after news coverage of Maria had increased, his approval rating in YouGov’s poll dropped to 40 percent, his disapproval rating rose to 44 percent, and the percentage of undecided respondents declined from 24 percent to 15 percent. Trump is losing the public relations battle over Maria, which may have been one of the reasons he lashed out at San Juan’s mayor for slamming the federal government’s response to the storm. For comparison, President George W. Bush received a 44 percent approval rating and 50 percent disapproval in a CBS News poll for his handling of Hurricane Katrina at this point after that storm. 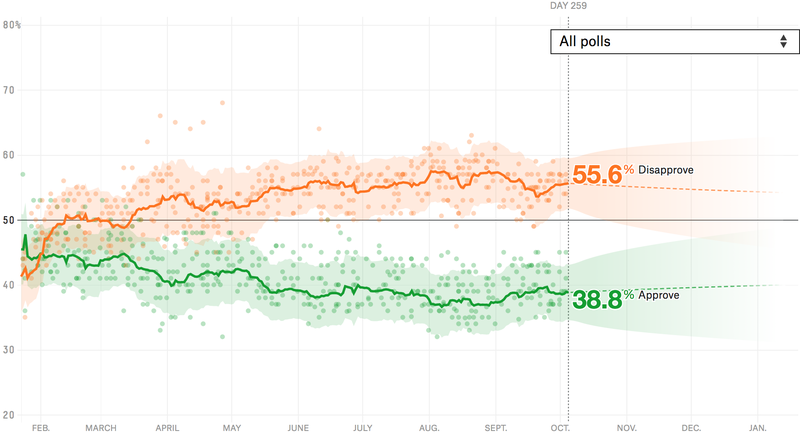 The “good news” for Trump is that his approval rating on Maria can drop significantly further only if his base turns against him. In the latest YouGov survey, his disapproval rating on Maria among Hillary Clinton voters was 87 percent. His disapproval rating among his own voters was only 5 percent. Maria, like so much else, has become politically polarized. Trump can’t do any worse on the issue unless Trump voters begin to disapprove. CNN viewers are similar to MSNBC’s — MSNBC has ridden Trump bashing to all-time record ratings. According to a new report from the Pew Research Center, however, CNN (which cultivates a down-the-middle image) and MSNBC (generally considered more liberal) have similar audiences in terms of ideological makeup. They have a similar percentage of viewers who identify as liberal Democrats — 26 percent at CNN and 30 percent at MSNBC — and conservative Republicans — 19 percent and 17 percent, respectively. The Fox News audience, meanwhile, may as well represent a different planet: Just 10 percent of Fox viewers call themselves liberal Democrats, while 43 percent call themselves conservative Republicans. Doug Jones has a shot in Alabama’s Senate race — Even though polls conducted before last week’s Republican runoff had Jones, the Democrat, hot on Republican Roy Moore’s heels, you’d have reason to be skeptical. No Democrat has won an Alabama Senate race since 1992. Polls conducted by Opinion Savvy and JMC Analytics since the runoff, however, have Jones down by only 6 and 8 percentage points, respectively. Moore is still the favorite, but this is probably going to be a lot closer than any Alabama Senate race in the past 20 years. More Americans don’t think gun control will stop mass shootings — There’s still so much we don’t know about Sunday night’s mass shooting in Las Vegas, the deadliest in recent U.S. history. Americans, though, are skeptical that legislation can do much to prevent future mass shootings. In a YouGov poll conducted after the killings, only 40 percent of Americans think stricter gun laws will reduce the number of shootings in the U.S., and only 41 percent think Congress should even take action to reduce mass shootings. Democrats and Republicans are moving further apart — Three years ago, the Pew Research Center published a landmark study showing essentially no ideological overlap between the two major parties. Only 4 percent of Republicans were more liberal than the median Democrat, while 5 percent of Democrats were more conservative than the median Republican. Both of those numbers were down significantly from 2004 and 1994. But if you thought the country couldn’t get any more divided, well … a new 2017 Pew report on political polarization, which I suggest you read in full, finds that somehow those percentages have dropped further! Just 1 percent of Republicans are now more liberal than the median Democrat, and 3 percent of Democrats are now more conservative than the median Republican. More from that Pew report: The partisan gap on Trump’s approval rating is way wider than for any president going back to Eisenhower. 43 percent of respondents rated the economy as “excellent” or “good” in CNBC’s new “All-America Economic Survey.” That’s a record high for the survey. In North Carolina, 75 percent of registered voters think Trump should cut deals with Democrats, per an Elon University poll. 63 percent of American adults think it’s best if the U.S. plays an active role in world affairs, per a new study from the Chicago Council on Global Affairs. Half the country thinks the government is doing too many things that are better left to individuals and businesses; 45 percent think it should do more, according to Gallup. A Washington Post poll of the Virginia governor’s race found a larger lead for Democrat Ralph Northam than other surveys — Northam led Republican Ed Gillespie 53 percent to 40 percent. Democrat Phil Murphy was ahead of Republican Kim Guadagno 51 percent to 37 percent in a Monmouth University survey of the New Jersey governor’s race. A Marist College poll shows Democrat Bill de Blasio crushing his Republican opponent Nicole Malliotakis 58 percent to 16 percent in his bid to win another term as New York City’s mayor. Trump’s job approval rating is 38.8 percent; his disapproval rating is 55.6 percent. That’s basically unchanged from last week. 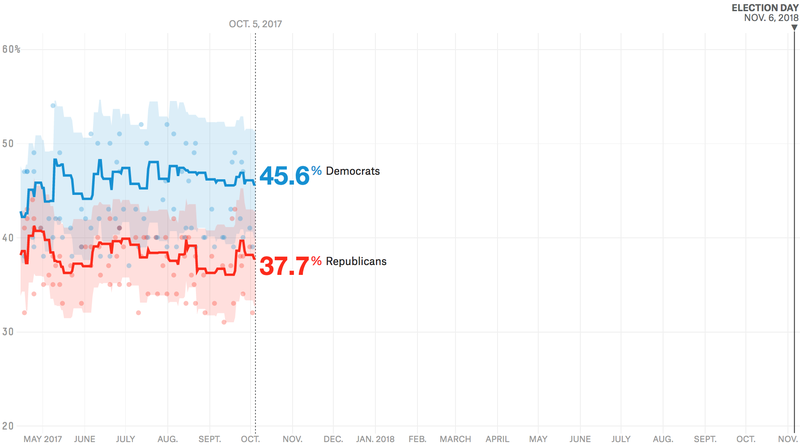 Democrats are ahead of Republicans 45.6 percent to 37.7 percent on the generic congressional ballot. That’s also nearly identical to last week.